There’s a character in Stories from the Forests of Leeds called the Bagman of Bagley. In the book, his story explores the idea of the baggage that we carry with us in life. The story was written by Oz Hardwick and was illustrated by Si Smith. Since the book was published, the pictures from this story have been placed in a triptych. A triptych is a traditional setting for an image of the suffering Christ surrounded on either side by images that tell other parts of the story. Seen in this setting, the Bagman of Bagley looks a Christ-like figure. The way he is carrying a lumpy black sack over his shoulder is reminiscent of rubbish collection in the days when refuse staff carried bags rather that moved wheelie bins. So, it is an image which implies service. 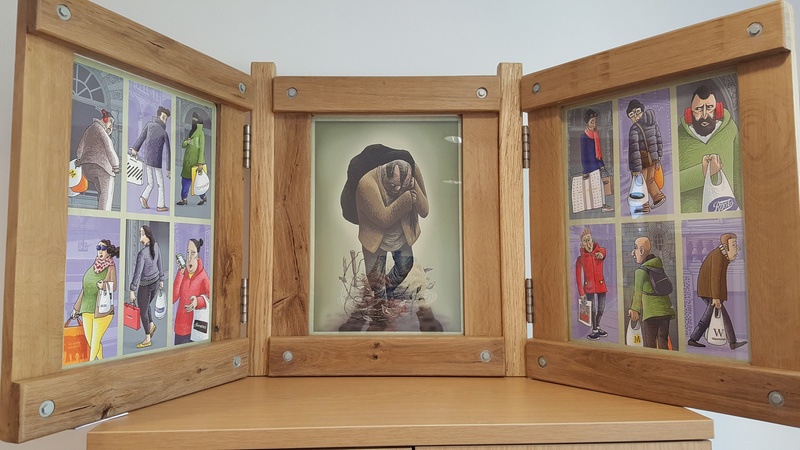 The sides of the triptych portray various Leeds shoppers, carrying their own bags, displaying various well-known high street brands. When you look at the three pictures together, it makes you wonder whether one day, the things in the bright shiny bags that people are carrying with pride will end up in the refuse sack, carried away when they become worthless, no longer living up to their initial promise. As he walks along, people appear to respond with a range of looks from disparagement to avoidance. His appearance and people’s responses have echoes of the portrayal of the Suffering Servant in Isaiah, who was afflicted, without beauty or comeliness, and who suffered for others (Isaiah 53: 1-7). These images together look beautiful and cast meaning on how we look at city life. They resonate for me with one of the most striking phrases in the book The Gospel of Relationship by Jean Vanier. (Jean Vanier is the founder of the L’Arche Community – an international network dedicated to the flourishing of people with intellectual or learning disabilities). “It is up to each of us to be liberated from the tyranny of normality and injustice”. Vanier, when reflecting on the Gospel of John, sees clearly that our liberation is to be called to live out Gospel values as the unique people we are, uniquely loved by God. More than this, that we are also called to be part of other people’s liberation; to enable them to overcome barriers erected by discrimination or perceptions of disability and ability for example, among other injustices enacted in the name of ‘normal’. This message is to the forefront of his reading of Jesus’ encounter with the first disciples (John 1: 35-42). It begins when John the Baptist announces, “Here is Jesus, the Lamb of God”. At first glance, a lamb is small and weak, needing to be cared for. It is perhaps surprising to say “Behold! A lamb!” But of course, the word ‘lamb’ carries a weight of meaning within the Jewish tradition. The words remind Jewish listeners of the time prior to the Exodus; the misery of the Hebrew people in Egypt, the calling of Moses to liberate them and the passing over of the Angel of Death. The lamb is a positive reminder of Passover and liberation but it is also a difficult image. The sacrificial lamb of the Passover meal and the phrase “Lamb of God” carry with them a sense of suffering, albeit a suffering that liberates. John the Baptist’s declaration, “Look, the lamb of God!” implies that Jesus comes to liberate. Jesus liberates us from our sin, sin that Vanier describes as simply our refusal of the love of God and the love of other people. We defend our hearts against God and against others, we fear and hate those who are different, we erect borders between people. Jesus came to liberate our hearts so that we might love others as he loves us. In this story, we see a pattern for establishing a relationship of love and liberation. When the two men turn to Jesus, he asks … “What do you want?” or… “What are you searching for?” They respond by asking where he lives because they want to spend time with him. Jesus invites them to “come and see”, and so he invites them into a relationship of love. Then, we hear that they told others about Jesus, and so became witnesses to this love. The linked themes of liberation and witness are so critical to Jean Vanier’s reading of the Gospel of John. Another inspirational example he describes is in the story of the Samaritan woman (John 4). We know that the Samaritan woman was married many times so she had experienced heartbreak, failure, rejection and shame within her community. Vanier calls her ‘a wounded woman’. And the first words that Jesus says to her are a request; he asks ‘Will you give me a drink?’ Jesus shows himself to be in need and he puts himself lower than her. By doing this, Jesus makes it clear that the right approach of love and compassion for a person in need is to empower them. He is not there simply to do good for or to her, but rather he wants to start a relationship which will involve sharing and mutual help. Through this encounter, the Samaritan Woman is liberated from the tyranny of normality and injustice; from her failure to fit all those ‘normal’ patterns of a woman’s life and marriage. She recognises that this encounter is extraordinary and she tells others about it, inviting them to come and see him. Vanier is convinced that all are called to share this liberation and witness; to share this vision of love, where the weak or those who don’t fit into normal patterns have a central place; where all are called to work with the rejected and the weak to create a new world together. Starting with the Bagman of Bagley, we can imagine what participating in this kind of liberation means to life in Leeds. In everyday life there are a myriad of individual opportunities to ask people ‘What are you looking for?’ and ‘Will you give me a drink?’ There are also a whole range of organised possibilities from Leeds Citizens asking communities what matters to them and organising actions, to the mutual sharing of Asylum Seekers and volunteers through the WYDAN initiative of night shelters. There is so much potential in Leeds for all to be liberated from the tyranny of normality and injustice.